Diane's Workshop: Tour of my "Workshop"
I thought you might like to see where I work. 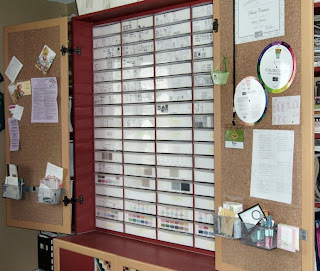 This picture is of the cabinet and shelves that has all my stamping and scrapbooking 'stuff' in them. The shelves have paper, art supplies, layout books, quilting books and patterns, knitting books, sewing books, and some of my genealogy books. On top of the cabinet are some bins that have things to alter and all my oldie stuffed animals are on top of the bookcases. I have all my dolls (from when I was a kid, as well as my mother's and grandmother's dolls) on shelves on the other side of the room. Alas, even since I took these pictures, I cleaned up and rearranged the shelves just a bit! This is the lower section of my cabinet. I just made the new shelf unit because I was tired of the 'mess'. 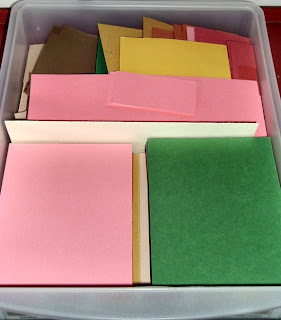 I keep paper in full sheets and half sheets on the shelf, along with some larger card/envelope sets. On top I have my templates, extra grid paper, and my Scor-Pal that I *just* got. I LOVE it! In the drawers are ribbon, hardware, reinkers, etc...stuff I don't have at hand all the time. 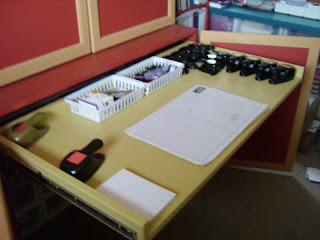 This drawer worktable is also in the lower section of my cabinet. Since I took the picture I added a whole lot of punches! Now they are along the 'back' of the table and the small ones are in a basket. This is the upper section of the cabinet. I have corkboard on the doors and some metal strips to hold magnetic baskets. I think I need a few more! Yes, there are really 72 drawers in here...I bought the Sterilite 3 drawer units and tossed the plastic thingy the drawers came in. 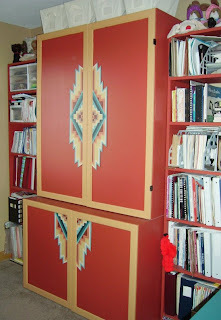 I had a friend build the cabinet especially for those drawers. 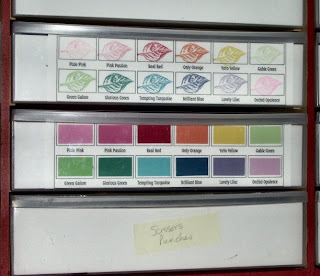 All my stamp sets, stamp pads, heatgun, EP, tools, brads'n'stuff, sponges, quarter-sheet and smaller paper, etc are all here, believe it or not! This is a closeup of some of the drawers. 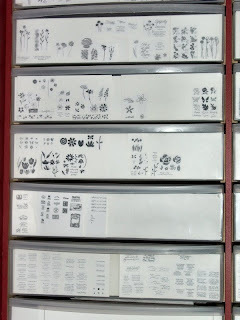 I stamped the images and reduced to 25% and placed them all on the front of the drawer. Works as an index of sorts. And this is what the inside of one of those drawers looks like. My sets are all unmounted. I have stamped the images on a card, put the name sticker on the card, and put the rubber (on EZMount) on the back of the card, behind the image. I haven't yet unmounted the wheels. I think I plan to, though. This is what the lowest drawers are like. Bottom row holds tools. 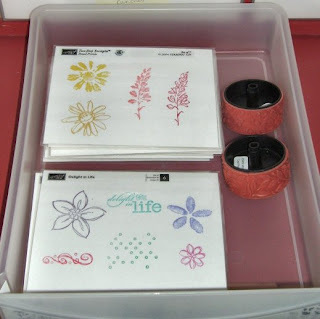 Next up is paper, then stamp pads and prismacolors, then embellishments and sponges. This is a paper drawer. In the front are all quarter sheets. I try to keep the paper colors together. In back are scraps. This drawer looks pretty neat right now! Very cool! It's amazing how organized you can be when you have a teensy space. I have a craft cave--which is basically a walk in closet. I sort of like having everything within arms reach. I can't believe how organized you are!! I keep telling myself to catalogue my stamp sets before it gets over my head. Ummm...I think it's too late! Keep going on your blog. You're doing great! HOLY COW! Can you come over and play?? (I mean organize MY stamp room??) Fabulous pics - tfs them! This is incredibly fabulous!!!! 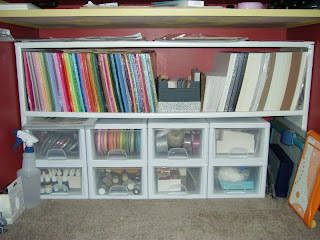 I'm hoping to spend time organizing my craft room while my boys are at camp for a month. Thank you for your inspiration. Wow, you are so nice and organized!!! What a great space! Wow! How organized you are! It'a pleasure to look at! Wow, Diane! I totally envy your organization. I have an armoire in my dining room, but that's the only spot to include EVERYTHING (except stamps, which are in the basement) and it ain't enough room! I need a space like yours!! Diane, I just noticed that you included us Punchkateerz on your sidebar -- gee, thankz so much!! I didn't know this before. RYPH!